When you tidy the KonMari way, you will experience several changes. For one thing, when you have finished cleaning up once and for all, you will never again relapse into clutter. You also will have clearly identified your values and what you want to do. You will be able to take good care of your possessions and will experience, every day, a feeling of contentment. The key to success is to tidy up quickly and completely, all in one go. Once you have experienced what your house feels like when it is completely tidy in the true sense of the term, you will never want to return to clutter, and the strength of that feeling will empower you to keep it tidy. The KonMari Method may seem a little hard. It does require time and effort. But, having picked up this book with the intention of at least making a good stab at seriously tidying up, please keep reading. And believe in yourself. Once you have made up your mind, all you need to do is to apply the right method. You would rather start tidying right away, would you? That is precisely why so many people suffer rebound after tidying up. When you imagine your ideal lifestyle, you are actually clarifying why you want to tidy and identifying the kind of life you want to live once you have finished. The tidying process thus represents a huge turning point in a person’s life. So seriously consider the ideal lifestyle to which you aspire. One characteristic of people who never seem to finish tidying up is that they attempt to store everything without getting rid of anything. When things are put away, a home will look neat on the surface, but if the storage units are filled with unnecessary items, it will be impossible to keep them organized, and this will inevitably lead to a relapse. The key to success in tidying is to finish discarding first. You can only plan where to store your things and what to store them in once you’ve decided what to keep and what to discard, because only then will you have an accurate grasp of how much actually needs to be stored. Thinking about where to store things, or worrying about whether you can fit everything in, will only distract you from the job of discarding, and you will never finish. That would be a terrible waste; so instead, consider any storage solutions made during the discarding process as temporary and focus all your attention on sorting the next category. This is the secret to getting the job done quickly. One of the most common mistakes people make is to tidy room by room. This approach doesn’t work because people think they have tidied up when in fact they have only shuffled their things around from one location to another or scattered items in the same category around the house, making it impossible to get an accurate grasp of the volume of things they actually own. The correct approach is to tidy by category. This means tidying up all the things in the same category in one go. For example, when tidying the clothes category, the first step is to gather every item of clothing from the entire house in one spot. This allows you to see objectively exactly how much you have. Confronted with an enormous mound of clothes, you will also be forced to acknowledge how poorly you have been treating your possessions. It’s very important to get an accurate grasp of the sheer volume for each category. It is crucial not only to tidy by category but also to follow the correct order, which is clothes, books, papers, komono (miscellany), and finally, sentimental items. Have you ever run across old photos while tidying and found that hours have passed while you were looking at them? This is a very common blunder, and it clearly illustrates the point of tidying in the proper order, which is designed specifically to help you hone your ability to distinguish what sparks joy. Clothes are ideal for practising this skill, while photos and other sentimental items are the epitome of what you should not touch until you have perfected it. 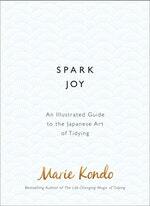 The criterion for deciding what to keep and what to discard is whether or not something sparks joy. When deciding, it’s important to touch it, and by that, I mean holding it firmly in both hands as if communing with it. Pay close attention to how your body responds when you do this. 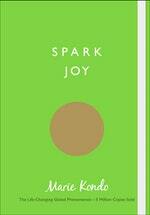 When something sparks joy, you should feel a little thrill, as if the cells in your body are slowly rising. When you hold something that doesn’t bring you joy, however, you will notice that your body feels heavier. Remember that you are not choosing what to discard but rather what to keep. Keep only those things that bring you joy. And when you discard anything that doesn’t, don’t forget to thank it before saying goodbye. By letting go of the things that have been in your life with a feeling of gratitude, you foster appreciation for, and a desire to take better care of, the things in your life.